Doctoral student Eric Hansen is in the second year of his counseling psychology program. His first psychotherapy client for the year is thirteen-year old Greg. The boy has been seeing apparitions of children, presumably long dead, roaming outside his bedroom window at his father’s house. For Eric, this case covers disturbing ground. Just a year earlier, a freshman at the university appeared at the clinic and reported similar harrowing images, only to discontinue his therapy after one session and never return. The haunting of Greg jolts Eric’s recollection of his own traumatic past and he is drawn into a whirlpool of unspeakable horror well beyond the scientific realm of psychology. Told within the context of multiple therapy sessions, Dead Works is horror novella in which a young doctoral student must help a boy make sense of ghostly and terrifying visions while simultaneously struggling against a world where acts of brutal evil threaten to destroy them both. "A compelling story and unexpected twists make Anthony Hains’s Dead Works a must read for fans of horror and dark suspense. Dead Works has claws that sink into you from the very first page and doesn’t let go till you reach the end. A thrilling page-turner. Highly recommended!" "Recommend for fans of a mix of heavy psychological horror and the supernatural!" "Dead Works is an alluring nightmare you won’t want to wake up from anytime soon. As frightening as it is clever, An﻿thony Hains has created a paranormal thriller that will have even the most ironclad skeptics sleeping with the light on. Read it." "This book couldn't give you more chills if you read it in a bucket of ice." "Hains is currently a professor of counseling psychology and his real-world experience really helps the story of Dead Works shine. The psychological elements are well-explained, but at the same time are accessible to those who do not have any experience with psychology.…overall Hains has crafted a story that draws you in with an intriguing mystery and some pretty clever plot twists. The premise of Dead Works has been explored plenty of times before, but Hains manages to put his own spin on it and it is a very effective plot device. Dead Works may not be breaking new ground, but it is still a gripping story that will be sure to appeal to horror fans looking for a quick and haunting read." ﻿"Anthony Hains' horror novel Dead Works is a psychological thriller that has me completely floored. I love ghost stories and Gothic horror, but this book takes it to a whole different level. 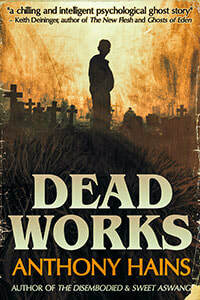 Dead Works is intelligent, well-plotted and beautifully written. The characters are believable, and I quickly became involved in their stories. I'm actually quite amazed at the impact that this relatively short novel has had on me. Dead Works is a prodigious work of horror fiction..."
"The author’s experience as a psychology professor with a focus on children shines through. Greg himself talks tough, peppering his speech with swear words especially when he and Eric first start meeting. As someone who’s been in counseling as a teen and talked like this to show how tough and “adult” she was in front of the therapist to hide her vulnerability, I related to this a lot. Also, Eric often repeats what Greg tells him in the form of a question to make sure he understands, which comes off like someone practicing a new skill they’re unfamiliar with–which Eric is. However, he’s patient with Greg and watching their relationship slowly develop was my favorite thing about the book."